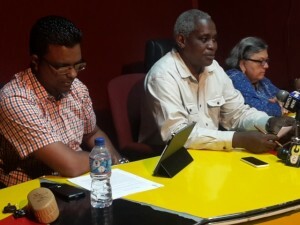 PPPC-nominated members of the Guyana Elections Commission (left to right) Sase Gunraj, Robeson Benn and Bibi Shadick. The People’s Progressive Party Civic (PPPC) representatives on the Guyana Elections Commission (GECOM) said they are ready to submit nominees for a new Elections Commission Chairman to President David Granger, if it is true that Dr. Steve Surujbally is about to resign the post. Elections Commissioners Bibi Shaddick, Robeson Benn and Sase Gunraj expressed surprise at a report in the state-owned Guyana Chronicle in which Surujbally is reported to have told the President that he was ready to step down in November, 2016 once a transition mechanism has been put in place. Shaddick said if the report is accurate, the government has a responsibility to inform Opposition Leader, Bharrat Jagdeo of the Chairman’s impending withdrawal from office, so that the parties could submit their list of six persons they feel can be elected to replace him. Guyana still uses the more than 20-year old Carter Centre formula for the selection of a Chairman. Observer missions by the Commonwealth, Carter Centre and the Organisation of American States have long urged that a new mechanism be developed to select and appoint the commission from a list of non-political persons. At a time when the Auditor General’s Office is auditing a multi-million dollar purchase of radio communication sets from a Water Street business, Shaddick said she and her colleagues were concerned that although the Elections Commission Chairman and its Chief Executive Keith Lowenfield are on leave, they are often at their place of employment. She believes that the GECOM Chairman has used the taking of leave to avoid holding meetings of the seven-member commission. Shaddick joined Benn in accusing the elections management authority of creating a “brick wall” of secrets which has prevented the Opposition Commission members from acquiring much needed information. Shaddik stated that every time questions concerning procurement of ballots and unknown staff members have been asked of GECOM they have received no answers. This, she said, can be seen as an act of treason. “Even Lodges give out more information than GECOM…and Lodges are secret organisations,” she said. Alluding to what he calls “thorough corruption,” Benn said if proper investigations were to be conducted there would be nothing left to hide with regards to the procurement. With regards to the investigation of the CEO, he noted that there have been rumours about 20 files having gone missing from the GECOM office last week. Gunraj told the news conference that from February 3, 2016 to date, the PPPC Commissioners have received no financial reports on the 2015 General Elections and the 2016 Local Government Elections. All three members are in agreement that GECOM cannot function without the hosting of executive meetings. Benn suggested that of the Chairman cannot host a meeting then there should be a meeting of co-chairs from both parties who can stand in on his behalf.